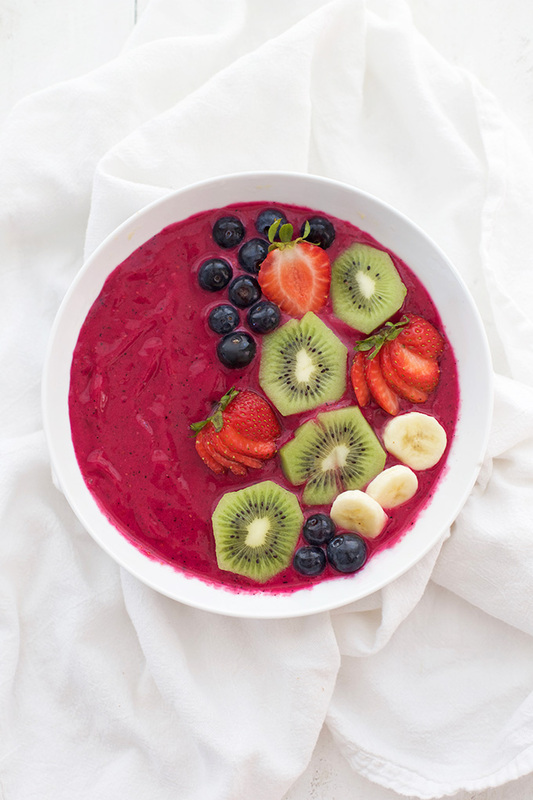 Smoothie bowls are bright, colorful, and full of goodness! 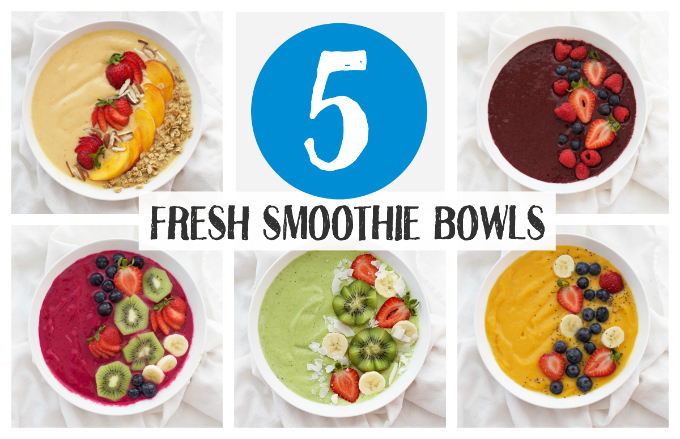 These 5 fresh smoothie bowls are just the thing to get you started. There’s nothing like a fresh, healthy smoothie bowl in the mornings (or afternoons, or evenings). They’re cool, refreshing, and energizing. The other great thing is that I always have a few bags of frozen fruit in my freezer at any given time, so I always have ingredients on hand for something. 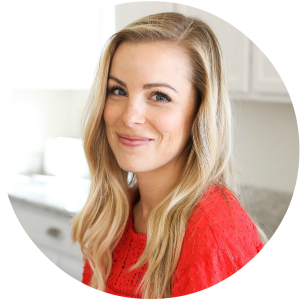 In just a few minutes, I have something easy that’s a heckuva lot more exciting on mornings when I want a change from the usual, or need something more colorful and nutritious than than a bowl of cereal on nights when we’re all too hot or tired too cook. 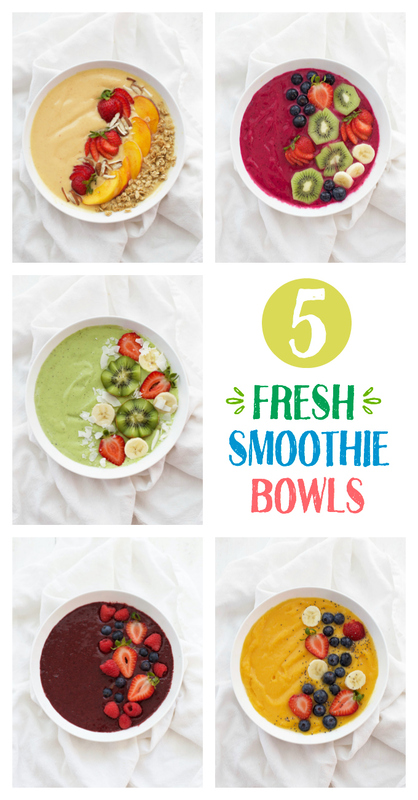 I’ve already shared a Mango Julius smoothie bowl and our basic method for acai bowls, but today, I wanted to pass along 5 other fresh and delicious flavors to try. I try to include a little fat or protein with every smoothie. This can be in the ingredient list (like a dollop of almond butter, or yogurt, or a splash of full-fat coconut milk), or in the toppings (granola, nuts, or coconut shavings). This will keep it from being a pure sugar/carbohydrate rush. Otherwise, we just pair the smoothies with a side of scrambled eggs or something to kind of anchor the meal. Frozen fruit will make a thicker smoothie. In my opinion, smoothie bowls are best when they’re more like soft-serve ice cream than a thick juice. I like these to be on the thick side, so I mostly use frozen fruit. 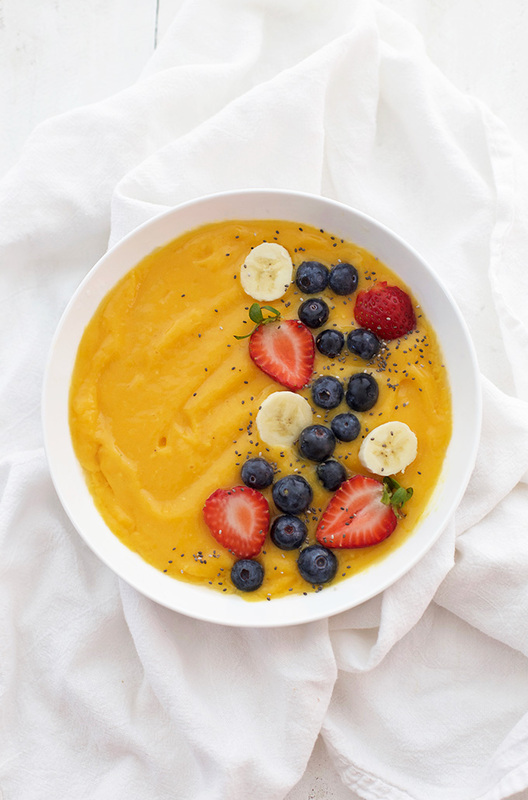 You can always add ice to a smoothie bowl if you’re using fresh fruit, or just go for the thinner smoothie. Freeze those leftovers! These recipes all make about 2 smoothie bowls. If I’m the only one eating one, I always pour the leftover smoothie into a popsicle mold for a snack later. Works like a charm! to get your wheels turning.. This very orange smoothie is loaded with beta carotene and vitamin C, and it tastes so fresh and light. I love to pair it with fresh berries, granola, and chia seeds. You can always add 1 Tbsp of chia seeds to the blender to help them blend in a little better (for the texture sensitive), but I usually sprinkle mine right on top. p.s. you can freeze extra carrot juice in an ice cube tray for a smoothie boost another day. It works like a charm! This very orange smoothie is loaded with the good stuff! It’s creamy and bright. Add all ingredients to a blender and puree until smooth. Top with your favorite fresh fruit, granola, or nuts! This smoothie is luscious and rich without feeling heavy. 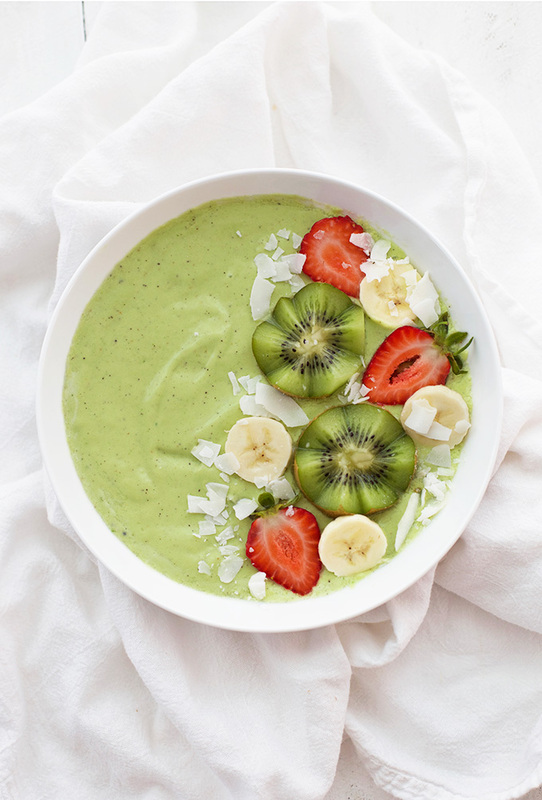 The fresh tropical flavors of pineapple, mango, and kiwi paired with the creamy coconut keep things bright, and a dose of green from the spinach adds a little nutritional punch. My kids don’t bat an eye at the color when I tell them it’s a kiwi smoothie. The leftovers make such amazing popsicles! p.s. change this up by adding a little lime zest, or fresh ginger. So good! This is luscious and rich without feeling heavy. Place all ingredients in a blender and puree until smooth. Top with your favorite fruit, nuts, or granola! Everything you’re looking for in a creamy peach smoothie. Peaches taste so good on their own, my goal is always to bring out the peach flavor instead of mixing in too many other flavors. The secret here is a drop of almond extract. Peaches and almonds are in the same family and really complement each other nicely. Top this one with berries, almonds, granola, or more peaches! p.s. You might not need (or want) the honey in this recipe. It’s up to you. I’ve found this is *just* enough to make the peach flavor pop without being too sweet. Also, you can use Greek yogurt or plain non-dairy yogurt for this recipe. If you’re not a yogurt person, you can sub your favorite milk (dairy or non-dairy) for a little creaminess. Place all ingredients in a blender and puree until smooth. Top with your favorite toppings! If you’ve never had it before, pitaya (Dragon Fruit) is an antioxidant powerhouse like acai. It has the most unreal color (it’s nearly neon!) and it works well with lots of other flavors, especially berries. Most often, you can find frozen packets of dragon fruit/pitaya puree right next to acai in the freezer section. This recipe works with pitaya or acai packets, so don’t worry if you can’t find one or the other. p.s. if you don’t have compunction about color, this one is great for adding a little spinach. The strawberry-banana flavor pops so much, the spinach hardly registers. 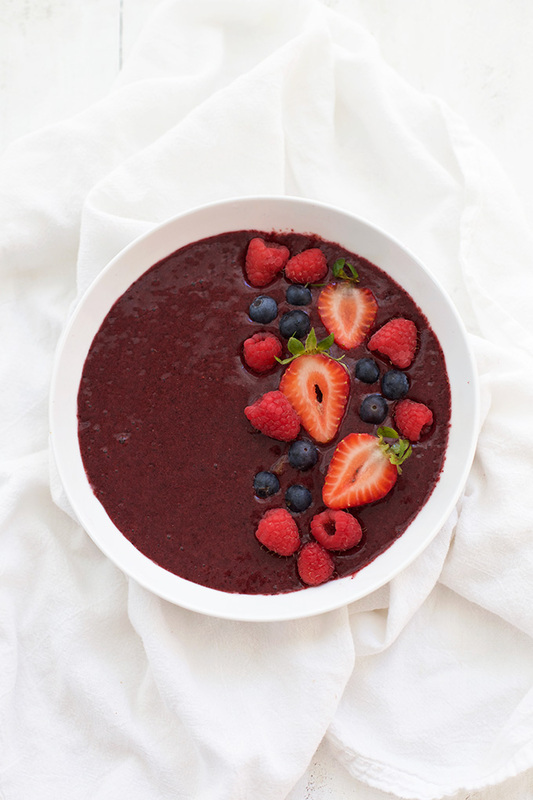 A smoothie bowl take on one of our favorite smoothies, this is a super home-base smoothie for getting all kinds of berries in. My kids really enjoy this one, and it makes dynamite popsicles. They don’t even know there’s spinach hiding in there, thanks to all that gorgeous berry color. Place all ingredients in a blender and puree until smooth, adding additional juice (or water) if needed to help it blend smoothly. Top with your favorite toppings! There you have it! 5 dynamite recipes to get you started. 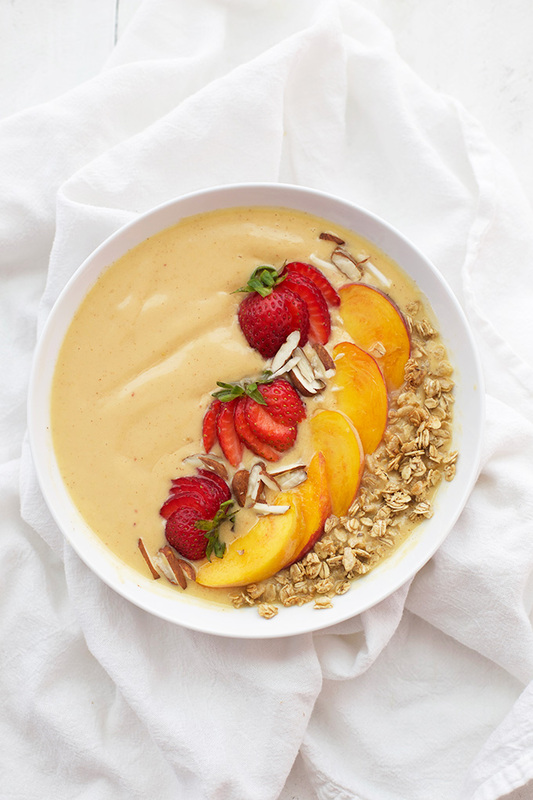 What are your favorite smoothie bowl combinations?